Stuff for Dads is a resource page offering links to relevant information for dads who need advice on everything from changing a diaper to developing the skills to build a lasting bond with your child. * The information provided here should not be used as a substitute for professional advice provided by a medical professional, licensed social worker or counselor. Teething is no fun for baby, mom or dad! Educate yourself on what to expect and what you can safely do to help your baby. Babies don’t come with instructions! Know what symptoms to look for, so you know when its time to call a doctor. The relationship may have ended, but both parents can work together to rear a happy, healthy child. Being a dad is all about finding your own path to what makes you and your kids happy. These tips can help. Discipline shouldn’t mean punishment. It should give a child tools to learn better behaviors. Effective conversation helps parents create lasting, meaningful relationships with their kids. These 10 powerful statements can get you started. 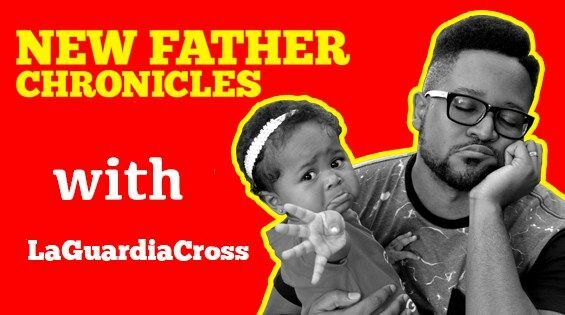 LaGaurdia Cross’ funny fatherhood series “New Father Chronicles” documents his adventures in parenting and offers advice for new dads. His series has over 23 million viewers, and he, his wife Leah and their daughters have been featured on the Today Show, HuffPost, Parents, HLN, and many more.